Jubilation! 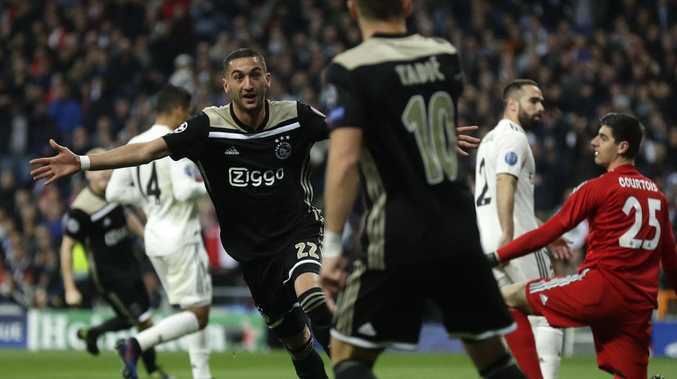 Ajax's Hakim Ziyech celebrates scoring the opening goal in the epic Champions League upset. Real Madrid's Champions League reign is over. Ajax stunned Madrid 4-1 at Santiago Bernabeu Stadium on Tuesday, eliminating the three-time defending champion 5-3 on aggregate in the round of 16 - and ending an unprecedented era of dominance by the Spanish team in the competition. Dusan Tadic, who set up both first-half goals, added to the lead in the 62nd, and Lasse Schone sealed the Dutch team's triumph - and its first quarterfinal appearance since 2003 - with a free kick from a tight angle in the 72nd. Marco Asensio had pulled the hosts closer a couple of minutes earlier. 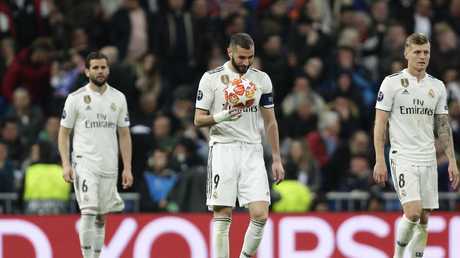 It was the fourth straight home loss for Madrid in all competitions, something that hadn't happened since 2004, and capped one of the worst weeks in the club's recent history. The team was coming off two demoralizing home losses to archrival Barcelona - 1-0 in the Spanish league and 3-0 in the semifinals of the Copa del Rey. Ajax was playing in the last 16 for the first time since 2006. The Bernabeu crowd went silent early when Ziyech opened the scoring after a breakaway that started with a run by Tadic through the right flank. The already nervous crowd was stunned again about 10 minutes later when Neres added to the lead from close range after Tadic got past a few Real Madrid defenders with a run from near the midfield, clearing Casemiro with a superb spin move and dribble. Neres beat Luka Modric to Tadic's through ball and went past Madrid goalkeeper Thibaut Courtois before finding the open net. Things got worse for Madrid as both Lucas Vazquez and Vinicius Junior had to be substituted before halftime because of injuries - being replaced by Gareth Bale and Marco Asensio. Although the hosts kept pressing, it was Ajax that kept threatening the most throughout the game, missing several chances to increase its lead. Tadic got his goal with a left-footed shot from inside the area, which was upheld after a lengthy video review to see whether the ball had gone out of play before Ajax launched a quick counterattack. Asensio gave his team a glimmer of hope in the 70th, but it was snuffed out just two minutes later when Schone's curling free kick from the left flank beat Courtois and sealed the stunning triumph. Real’s season just went from bad to worse.